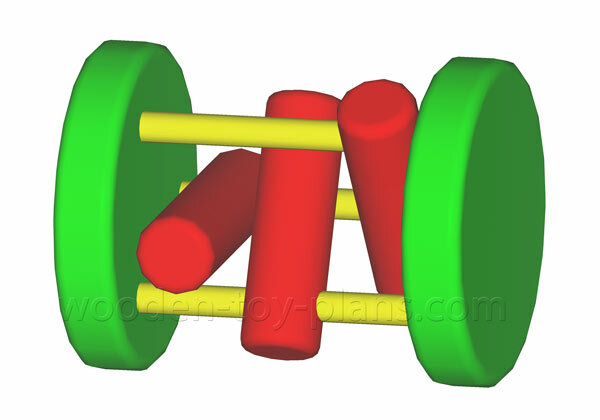 Print ready PDF wooden toy plans for a traditional rolling toy. Instant download. Easy woodcraft project for the beginner. Click to download free instructions. Use child safe paints or food colouring or leave it untreated. Chances are the average home handyman will have these most of these tools already. Power drill corded or battery powered. Jigsaw, scroll saw or coping saw to cut the round shape. Combination square a measuring tool I use all the time. Can you ever have enough woodworking clamps? For this free wooden toy plan, none of the dimensions are critical, so these measurements are guidelines only. This toy can be made from pieces of scrap timber. 19mm (3/4") thick timber, 90mm wide and about 200mm long. 8mm dia. dowel, 3 pieces 100mm long, pretty common. 25mm dia. dowel, 3 pieces 80mm long sometimes used as broom handles. Cut two circle shapes from the 3/4" thick timber. Drill three holes about 20mm offset from the edge of each disc to fit the 8mm dowel. This is how I make large diameter wooden discs using a simple but effective woodworking jig. Cut three pieces of 8mm dowel to lengths of 110mm. Chamfer the ends to make it easier for assembly. Cut a slot in each end of the dowels with a hacksaw as shown in the photo. Make sure to cut in the same direction as the grain. Cut three pieces of 25mm dowel to lengths of 80mm. Drill one hole in each at least 16mm (5/8") from the end. Use the 8.5mm drill bit so that it will rotate freely around the 8mm dowel. Smooth and round all the edges. Glue the yellow dowels into one of the green discs. Thread the red dowels in such that the other end fits between the other two yellow dowels as shown in the illustration below. Glue the remaining green disc in place and the toy rattle is complete. A range of ready made traditional wooden toys for sale at Ebay.